Hey guys! I have another purple mani to share! What did I say about purple before...I feel like I never wear it and then when I do, I wind up wearing it for a week! I put this on last week after doing some swatching and then got distracted when the UPS guy showed up with my Ulta order....wha-lahh, mani for the week! haha! This is my first time using Ella + Mila polish. I have a couple that were a gift from a friend and I've been dying to use them! CAN WE PLEASE talk about the cuteness of the bottles???? They all have little elephants on them. On the bottles. Elephants. I also wanted to dig into my little collection of Funky Fingers glitters...I have several I picked up here and there and I keep forgetting to use them! So be on the look out for those soon!! Most of the ones I have are still available at Five Below stores. 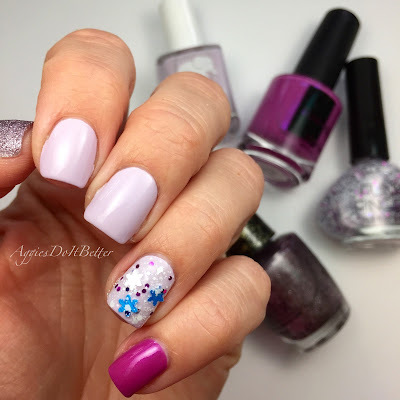 This was a super easy mani, for this method I usually start with the one polish I want to use most, then I look through my glitters for one that matches, then I find a couple other polishes that match the glitter, usually including a texture! I gotta have texture on my thumbs at least! 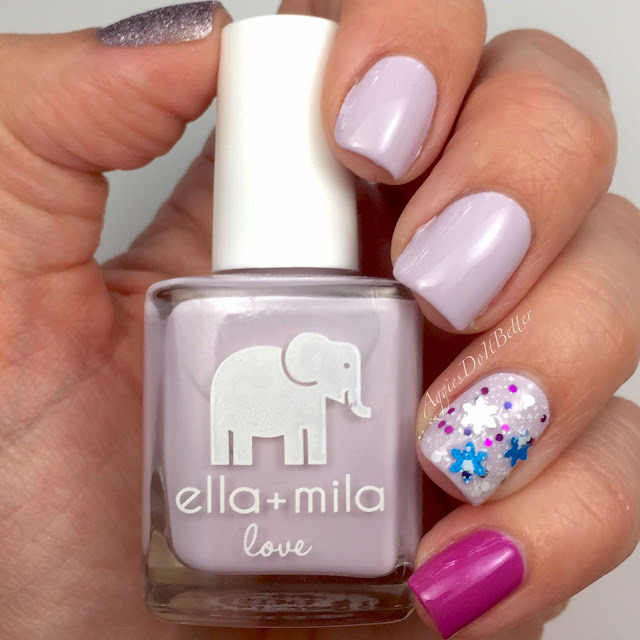 Ella + Mila "Lilac Luster"
OPI "Baby Please Come Home"
note on the Funky Fingers...they (still) have 3 glitters that are Frozen themed! Anna, Elsa (light blue and white) and Olaf (all white)!!! All of them have little snowflake glitters in them. I DON'T CARE if they aren't seasonally appropriate, I'm still going to use them! "Anna" has small matte white hex glitters, metallic fushia hex glitters, metallic purple glitters, teeeennyy tiny white glitters and blue and white snowflakes. gah! The snowflake glitters do kinda stick up a little bit, and I do tend to pick at them a little. The blue one definitely didn't survive the week ;) The formula on the Ella + Mila and the Blanc Morena (also first time using this brand!) are amazing! The BM was a gift also and I have a couple more to be using soon! I just love them and the names. 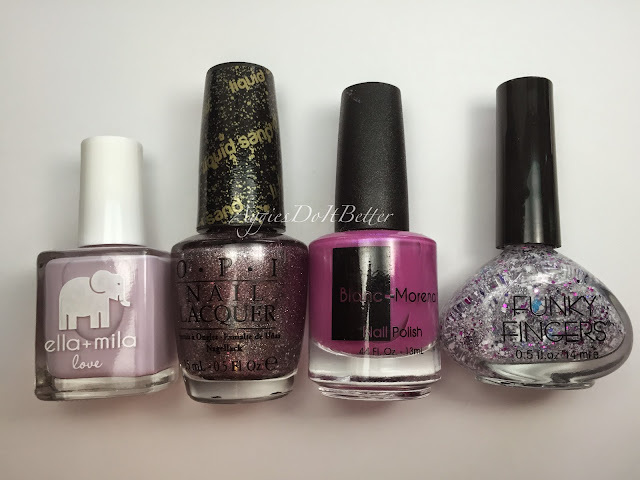 Zoya Earth Day sale 2015: My reccomendations! Bliss Polish LE Starbucks Swap polish!